Welcome to the AcSEED Newsletter for Summer term 2017. The record temperatures in June have ensured crowded beaches and rampant bar-b-que sales, but we should be mindful that the hot weather also brings a dilemma to young people concerned about exposing marks from self-harm. Since the spring term Newsletter an additional 7 schools and colleges have achieved AcSEED accreditation, including the first dedicated early years/preparatory school to receive the award (see full story below). A specific aim of The AcSEED Initiative was to encourage greater consistency in the type and quality of mental health and wellbeing provisions in UK schools and colleges. There are now AcSEED accredited organisations in 11 different UK counties, and registered schools and college working towards accreditation in 30 counties! Another pleasing trend is the number of organisations and charities that are starting to structure their services around the AcSEED framework. This further helps to ensure consistency in wellbeing provision to young people, and schools and colleges that utilise these services are consequentially well placed to apply for AcSEED accreditation. AcSEED promotes the need for a whole school approach to mental health and wellbeing support, provides a common framework to help structure wellbeing provisions, and an accreditation scheme that provides formal recognition to those organisations that can demonstrate their commitment to providing such support to their students. However AcSEED is also a highly collaborative scheme that depends on organisations with relevant skills and experience to provide schools in their local area with appropriate guidance and services. There are many such organisations and charities across the UK, and the AcSEED framework enables them to engage with schools in a structured and consistent way. The young royals continue to play a prominent role in promoting the need for additional support of young people's mental health. In a recent interview Prince Harry talked openly about the impact that his mother's death had on his own mental health. In this newsletter AcSEED founder Charlotte discusses how early intervention counselling, a key requirement in the AcSEED wellbeing criteria, can support young people who are suffering emotional distress. We hope you all have a pleasant and enjoyable holiday season, and look forward to working with you again in the next academic year to further strengthen young people's mental health in our schools and colleges. If you would like to submit an article, letter, or notification of a future event to be included in the AcSEED Newsletter please see the contact details below. Congratulations to The Mulberry House School, London, who are the first dedicated early years/preparatory school to be accredited with The AcSEED Award. At a ceremony to mark the achievement on Thursday 18th May 2016 the award was presented to the children and staff at Mulberry House. 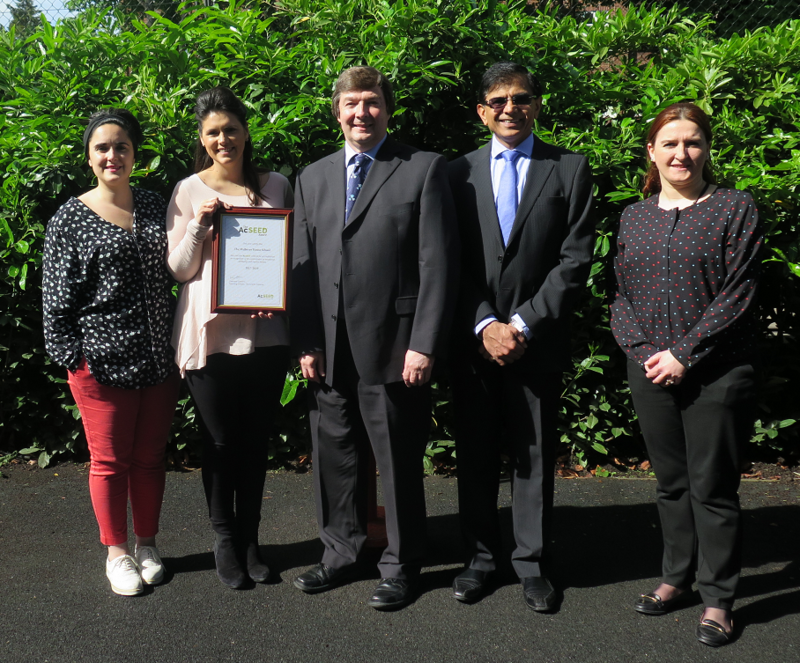 AcSEED Chief Executive Nick Gatherer (centre) presents the award to Mulberry House Head Teacher Victoria Playford, Head of Operations Vijay Tanna, and Team Leaders Carla Garcia Fernandez and Maria Fojo Nebnil. "AcSEED promotes adoption of best practices in supporting the emotional wellbeing and mental health of young people in schools and colleges, and provides recognition for organisations that satisfy the AcSEED criteria for wellbeing support" said Charlotte Gatherer, founder of The AcSEED Initiative. "The AcSEED assessment team were impressed by the comprehensive wellbeing support provided by The Mulberry House School, by the targeting of wellbeing provisions to specifically address the needs of age groups within the school, and by the high degree of staff awareness and engagement which creates a very strong wellbeing ethos". The Mulberry House School, an independent school based in Hampstead, is the first school in London to be accredited in recognition of its commitment to the emotional well-being and mental health of its pupils. “This award is valued by staff, children and parents just as much as our recent ISI inspection where we received 'excellent' across the board. We are delighted with the result and its recognition,” said Victoria Playford, Head Teacher. “Having received excellent grades in all curriculum and statutory areas during a recent inspection and now to have become the first EYFS setting to receive this wonderful, worthwhile and ground-breaking award makes us, our pupils, parents and teachers feel very proud. It is great to lead the way”, said Bethan Lewis-Powell, director and founder of The Mulberry House School. Earlier this year Prince Harry discussed openly how his personal development was impacted by the untimely death of his mother, Diana, Princess of Wales. The young royals have made a concerted effort to challenge the stigma surrounding mental health, and indeed their Heads Together campaign has reached far and wide with the bright blue headbands handed to every runner in the 2017 London Marathon and even becoming a facebook filter. However Harry's latest interview is of a far more personal nature and provides some insight into why he feels so passionate about the subject. In an interview with The Telegraph  he described how he “shut down all his emotions” for 20 years, seeking counselling only when he recognised the extent to which stress and anxiety were impacting his social life and work commitments. In some respects the life style of Prince Harry, and the events and publicity surrounding the death of his mother, can be considered unique. However Harry's reaction to the situation, 'burying his head in the sand' and avoiding open discussion about his emotions, are very typical of young people faced with emotional turmoil. Such feelings can be prompted by traumatic events including bereavement, but can also be caused by more protracted circumstances such as bullying and low self esteem. Prevention - helping all young people to develop their self esteem, emotional resilience, and social skills. Building an awareness of mental illness also equips them to support peers experiencing difficulty and to challenge mental health stigma. Early intervention - providing additional support to young people faced with emotional trauma, or exhibiting early symptoms of a mental illness. Early support can help to prevent further escalation. Specialist support - ensuring that young people needing more specialised and/or focussed interventions can be referred efficiently to relevant external organisations such as CAMHS. According to the Early Intervention Foundation, "Early intervention is about taking action as soon as possible to tackle problems for children and families before they become more difficult to reverse” . This may involve supporting children in high risk groups of developing mental health problems or acting quickly when individuals start to exhibit symptoms. Giving young people the opportunity to receive help early can prevent problems from becoming entrenched, or from spiralling further downhill which can result in long term harm and the need for crisis interventions. Timely access to specialised support. Preventing the progression of illness. Improving life outcomes, eg through remaining in education. Financial savings in secondary care services. With Child and Adolescent Mental Health Services (CAMHS) facing a dramatic increase in the volume and complexity of referrals, there is a strong and urgent need for other organisations to help minimise the CAMHS workload by providing early intervention. The AcSEED Initiative believes that schools and colleges can make a significant contribution. Young people spend a considerable amount of time at school, and may find this a safer environment in which to discuss their feelings. Teachers are often well placed to identify changes in behaviour and attitude, or to spot other early warning signs. Providing even modest levels of emotional support early can go a long way to avoiding further problems, and does not necessarily need to come from a specialist mental health professional. The growth of AcSEED in part reflects the growing recognition of the need for prevention and early intervention. The initiative was initially targeted at secondary schools and colleges as this was the point at which many of the founding members started experiencing mental illness. However as the scheme progressed it received increased interest from primary (and even preparatory) schools who were conscious that emotional difficulties often emerged at earlier ages. According to the Mental Health Foundation "50% of mental health problems are established by age 14 and 75% by age 24" . We don't know whether additional support in the school environment could have encouraged Prince Harry to seek help and support at an earlier stage, but AcSEED is aiming to ensure that all schools and colleges at least provide the opportunity for young people to benefit from early intervention. A strong wellbeing ethos is vital to encourage students to take the first steps towards discussing their feelings, and with the confidence of knowing that they are not alone. As Harry himself observed, “The experience I have had is that once you start talking about it, you realise that actually you're part of quite a big club”. The Telegraph: Interview with Prince Harry. A poll by YouGov  on behalf of The Princes Trust reveals that more than three-quarters of young people believe there is a lot or some stigma associated with Mental Health issues, and would not ask for help if they were suffering. A sample of 2,215 young people in the 16 to 25 age range took part in the on-line survey in November 2016. 48% experienced problems during their school/college years that prevented them from focussing on their studies. Of those who experienced a problem, 46% didn't talk to anyone about their situation which was most often because they did not want anyone to know they were struggling or did not think talking to someone would solve the problem. 32% didn't know who to ask for help. “Increasing the understanding and awareness of mental health problems among young people should be a key priority” said Prof. Louise Arseneault , a mental health leadership fellow at the Institute of Psychiatry, Psychology and Neuroscience at Kings College London. The AcSEED wellbeing criteria requires a learning programme that promotes strong mental health, builds an understanding of stress and anxiety together with coping mechanisms, develops an awareness of mental health illnesses, and ensures that all young people know what wellbeing provisions are available to them and who they can talk to in confidence. YouGov: Youth Index Report 2017. BBC: Young people 'fear stigma' if they ask for mental-health help. Schools and colleges have a front line role in promoting and protecting children and young people's mental health and wellbeing. We support a whole school approach that embeds the promotion of wellbeing throughout the culture of the school and curriculum as well as in staff training and continuing professional development. Strong partnerships between the education sector and mental health services improve the provision for children's mental health and wellbeing. With half of all mental illness starting before the age of fifteen, it is a false economy to cut services for children and young people that could help to improve wellbeing, build resilience and provide early intervention. We very much welcome the findings of this report which are very much consistent with the whole school approach to emotional wellbeing and mental health support promoted by AcSEED. The committee received evidence from more than 200 individuals and organisations which again emphasises the importance of having a common wellbeing framework such as AcSEED through which the many stakeholders involved in the mental health sector can provide guidance and support to schools in a structured and consistent way. Government report: Children and young people’s mental health — the role of education. World Mental Health Day is on 10th October 2017. Schools up and down the country will be wearing yellow and learning about mental health. Having a mental health problem can be an isolating experience for young people. By holding a 'Hello Yellow' day, a scheme being run by the charity YoungMinds, your school can show students, staff and volunteers that they're not alone. Register here for a free ‘Hello Yellow’ pack, including a mental health assembly plan, fun activities to combine fundraising and wellbeing, and much more. The AcSEED Initiative is aware of these future events that have a relationship to emotional wellbeing and mental health support in schools and colleges.